840 min. PBS. Cast: Keith David, Tom Hanks, Josh Lucas, Bobby Cannavale, Samuel L. Jackson, Eli Wallach, Robert Wahlberg. With their seven-part, fourteen-hour docuseries The War, aired on PBS, filmmakers Ken Burns and Lynn Novick prove they're not immune to the tendency to romanticize World War II from an American perspective. The War does so partly in its participants (all of the talking heads are survivors of the period; none are relatively objective historians) and partly in its deemphasis of political machinations and emphasis on emotion. Burns and Novick do not skimp on war horrors, and they are quick to recall moral missteps of the military and government (African-American segregation and Japanese-American internment crop up in the first episode), but the filmmakers' self-imposed marching orders are to allow survivors to tell their stories, not to delve into the whys and wherefores. Within that limited framework, the sprawling series succeeds in its goals, though it sometimes raises questions it would rather leave to others to answer. The War weaves recollection through essay, an elegant prose narration that also incorporates primary documents (like newspaper columns and letters) read by a roster of professional actors that includes Tom Hanks (natch), Samuel L. Jackson, Bobby Cannavale, Josh Lucas, Adam Arkin, Ernie Hudson, and Eli Wallach. 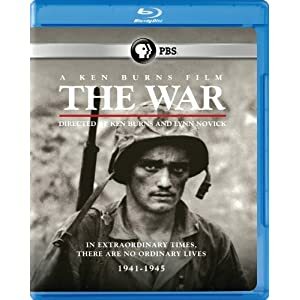 True to Burns' popular form, The War makes use of archival photographs, clippings, newsreels, and music to illustrate the narrative, though the greatest impression is made by the "Greatest Generation" interviewees, articulate and still-vital men and women offering to the camera stories they haven't always felt comfortable sharing (and some that were probably fairly weather-beaten by the time the filmmakers heard them). With understandable defensiveness, each episode begins with the epigraph "The Second World War was fought in thousands of places, too many for any one accounting. This is the story of four American towns and how their citizens experienced that war." Narrator Keith David lays out the concept in the first episode, "A Necessary War": "The war touched every family on every street in every town in America—towns like Luverne, Minnesota; Sacramento, California; Waterbury, Connecticut; and Mobile, Alabama—and nothing would ever be the same again." The focus remains more so overseas than in these towns, with the series following residents through their service experiences, but also spending some time with those who were left behind and examining the war's effects on the towns themselves (primarily mobilization and mourning). Occasionally, The War will stray from its concept to allow participants not from one of these towns (such as Daniel Inouye) to fill in a narrative gap. On the whole, the participants are cannily chosen for a combination of telegenic quality and proximity to history, one a participant in the Bataan Death March (Glenn Frazier), another in Guadalcanal (Sid Phillips), and so on. Since so many regard Burns' PBS megaseries as documentaries of record, The War also became a political lightning rod when Hispanic and Native American groups protested that the series' interviewees did not reflect their ethnicities. Burns and Novick compromised, refusing to reedit their film, but conducting new interviews for extended epilogues that would be tacked onto the episodes. On home video, these follow somewhat seamlessly from the original edits, but the sudden emphasis on Latino and Native American perspectives quickly reveals these passages to be the afterthoughts they were. On occasion, the music by Wynton Marsalis competes a bit with the imagery, narration or interviews, and Burns stokes fresh propaganda in Gene Scheer's romanticizing "American Anthem," sung by Norah Jones (it seems entirely possible that PBS darling Burns includes Marsalis and Jones more so because he can than that they're artistically valid choices). While The War at times leaves one yearning for more intellectually curious analysis, it remains a potent emotional montage of the feelings wrought by battle, despair abroad and at home, patriotic anger and pride, and hope against hope that "the boys" will make it home victorious. 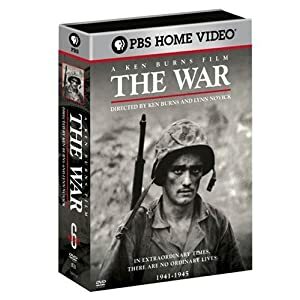 Paramount Home Entertainment packages the PBS series The War in a sterling six-disc Blu-ray set. Tech specs are strong, with video and audio that maximize the source material. The hi-def picture incorporates a wide variety of elements, but the transfer of The War is rock-solid throughout. Naturally, the newer interview footage yields the most texture and detail, but the archival visual information remains as clean and clear as possible. In hi-def, the series looks as sharp, warm and inviting as ever. The Dolby Digital 5.1 sound mixes are fairly dynamic and certainly well-balanced, with a premium put on clear speech and active sound effects; music also comes through nicely, if not with the impact that would come with a lossless presentation. Given that the feature is a documentary that's over fourteen hours long, one might not expect much in the bonus features department, but PBS offers quite a bit. Many may find the most interesting bonus feature to be the two audio commentaries by filmmakers Ken Burns and Lynn Novick, since they explain their choices of concept and construction, and generally discuss how they went about making the ambitious film and their experiences gathering the material, including the new interviews. Burns and Novick comment on the first ("A Necessary War") and fourth ("Pride of Our Nation") episodes. "Making The War" (36:24, SD) also includes comments from Burns and Novick, among others. The topics covered are similar to those discussed in the commentaries: the series' philosophical approach, selection criteria, post-production and music, and more. "Deleted Scenes" (44:18, SD) include "War Correspondents," "Attacks on Aachen and Metz," "Flies," "Al McIntosh on Sacrifice," 'Sid Phillips Writes Home," "Order 9066," "Breaking Out of the Hedgerows," "War Town," "Wax Work," "Jim Thomas Dies," "Fussell Kills," "The Old Country," "Operation Cobra," "Sam Hynes on Okinawa," "Inouye's Lucky Dollar," "Returning Fathers," and "Sascha Comes Home." The set also gathers "Additional Interviews" (55:26, SD) from fourteen of the participants: Quentin Aanenson, Asako Tokuno, Barbara Covington, Joe Medicine Crow, Paul Fussell, Tom Galloway, John Gray, Sam Hynes, Daniel Inouye, Sascha Weinzheimer, Jim Sherman, Burnett Miller, Bill Lansford, and Katherine Phillips. All site content © 2000-2019 Peter Canavese. Page generated at 04/18/2019 12:02:22AM.